The device that have been rumoured about is finally here, Infinix Zero Gold, the device is still the same Infinix Zero but a golden design was produced which is making it very unique, The Infinix Zero was also perfect with the white and black colours, the difference the Infinix zero gold has it just the 16GB internal storage it possesses, so if in case want the cheaper model you have to stick with the 8GB which is the black and white. Announced in Available September 2014. The Infinix Zero has an very nice and expensive materials body, it’s covered all through with Gorilla Glass 3, The back is made of brushed metal with a glass finish giving it that premium look anyone would fall in love with. The device is slim and the metallic frame makes it more alluring. The physical appearance is chiseled almost to perfection and the edges are slightly curved. 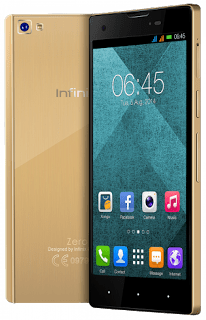 Infinix Zero Gold performance should also be golden as it runs Android 4.4.2 (KitKat) on a 1.4GHz octa-core processor with 2GB of RAM it also features a 5.0-inch HD Capacitive Touch IPS Screen. The gold coloured Infinix Zero is only available with 16GB. It has a resolution of 720 x 1280 pixels with a pixel density of 294 ppi. This device comes with a 13MP rear camera and a 2MP front camera. The camera specs doesn’t look so great. The camera is equipped with a LED flash and other features include HDR, Motion Tracking, Geo-tagging and Auto Focus, Only the colour changed in the device. Presently I can say that, Infinix Zero series are proving to be the best and most affordable mid-range smartphones in Nigeria which has the most appealing specifications, premium build and the surprisingly low price. Their device presently are receiving the a good welcoming in the market.